A Kindermusik Class for the Whole Family! Music2Grow will soon be introducing Family Time to its curricula offerings. Would you like to join a Kindermusik class but with the addition of a second or third little music-maker to your family, it just doesn’t seem possible? Do you wish you could spend time together with your children, doing one activity as a family? Then Kindermusik Family Time is for you. 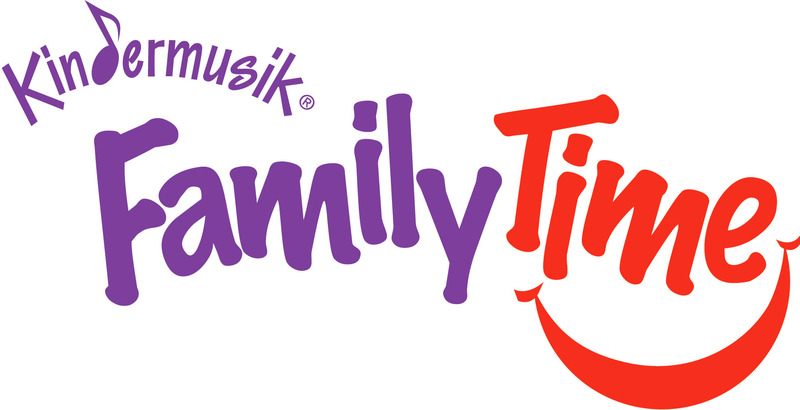 Kindermusik Family Time is for parents with children aged newborn – 7 years. Bringing children of all ages together provides a dynamic and integrated learning experience for everyone. Favourite Kindermusik songs and activities such as “Shake, Shake the Apple Tree” and “hammocking” are rolled into one class where each child is welcomed and valued and family “together time” is celebrated and cherished. With older children ready to show the little ones how it is done and the younger ones eager to learn, Family Time becomes a multi-layered learning environment that brings families together. This playful unit is centred around the theme of going on a family outing: a visit with a friend, an outing at the park, a trip to the city, an afternoon at the aquarium and a day on the farm. Move like animals with this unit’s story Flip-Flap, Sugar Snap! And follow a girl’s adventure as she loses her jambourine during the day’s outings and then finds it in the story Jingle-Jangle Jambourine. Family Time At Home Materials have been carefully created to bring out the music—and the learning—in your family. 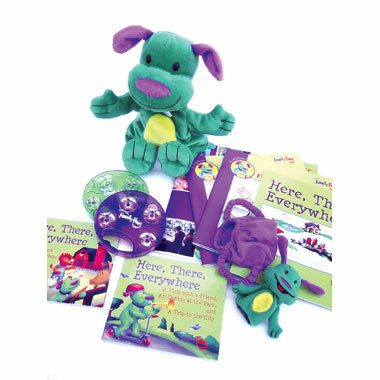 Specially designed to fit the varying ages and learning abilities of your children, this set will help you bring the learning and the music-making home, as well as become a lasting, well-loved favourite of the toy box and book shelf. Hand and finger puppets: (Wags and Little Wags). With his wide smile and soft plush fur Wags the puppet is sure to be a new favourite in your house. His zip-up puppet pocket makes a great place to stash your instruments. And his handy backpack makes a great finger-puppet holder for his pal. Two literature books: Flip-Flap, Sugar Snap; Jingle-Jangle Jambourine. Each book has three story styles that are age-appropriate and engaging to the various readers in your family: artful illustrations of a literature book, games and activity pages, and a cartoon-style story board. Activity Book: Sing, Play and Grow! A 42-page activity book full of craft and music-playing ideas. Special developmental tips are placed by every activity for a fun learning experience for every age—from your one-year-old, to your seven-year-old. Plus you’ll find song lyrics, sheet music, and intriguing trivia about the music you’ll hear in class and on your home CDs. A family-friendly board game where players travel around the board via the city, aquarium, farm, friend’s house and a park. Join us for this unique family-oriented Kindermusik curriculum and see how music helps your family learn together, laugh, dance and share together. For more information or to register contact Music2Grow. Previous Post Now Enroling for Term 2!